What a glorious day to enjoy the nature in West Seattle! We saw many seabirds from our vantage points along the shores of Puget Sound and had a beautiful walk in the temperate rainforest of Lincoln Park. 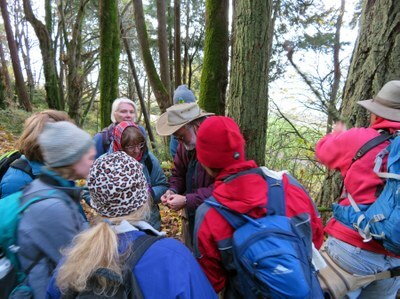 We began our West Seattle field trip at Jack Block Park on a brisk autumn morning. This site allowed for excellent viewing and identifying of several sea birds, e.g., a flock of graceful Western Grebes, White-winged Scoters on the wing, a raft of gorgeous Barrow's Goldeneyes, and Great Blue Herons among others. Rowdy California Sea Lions swam and cavorted near our viewpoint. Here in the brushy areas we saw flocks of Yellow-rumped Warblers and Pine Siskins. A Belted Kingfisher flew from perch to perch giving his rattly call--yes, it was a male. Spotted Towhees foraged in the leaves beneath the bushes. Our next stop was at Duwamish Head across from Downtown Seattle near Don Armeni Boat Ramp. 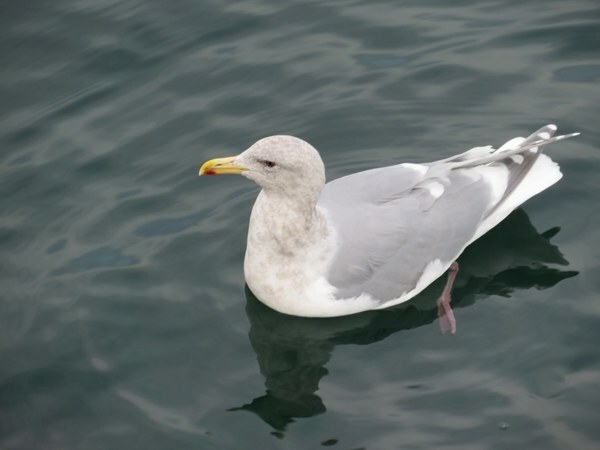 Glaucous-winged and other gulls soared and swam nearby. More Western Grebes were seen. Pelagic and Double-crested cormorants commandeered a large buoy where they perched and spread their wings to dry. Moving along to Lincoln Park, we were soon seeing Surf Scoters near the ferry dock. Horned Grebes were plentiful here as were Harlequin Ducks and Red-breasted Mergansers. The two spotting scopes our leaders brought along were set up, allowing for closer looks at these beautiful birds--such as a couple of Red-necked Grebes. By now the sun was feeling nice and warm! We took a trail away from the shore and up to the top of the bluff in the temperate rainforest. 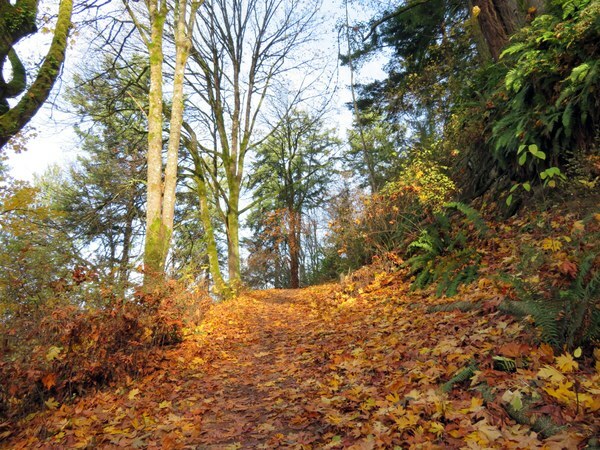 The trail was covered with yellow leaves and lined with dark green Sword Ferns. Douglas Firs and Big-leaf maple trees towered above us. Our guides, Gordie and Stewart, took time to guide us in the use of hand loupes (magnifiers) that we used to examine the plentiful mosses and lichens growing on the trees and branches. A pleasant walk back to the parking lot ended this excellent day enjoying the nature of West Seattle.